An aerial view of the 213 acres owned by the Archdiocese of Philadelphia. Carlino Commercial Development, working under the name Sproul Road Developers LLC, hopes to develop nearly 53 acres of the land, leaving the rest as open space. 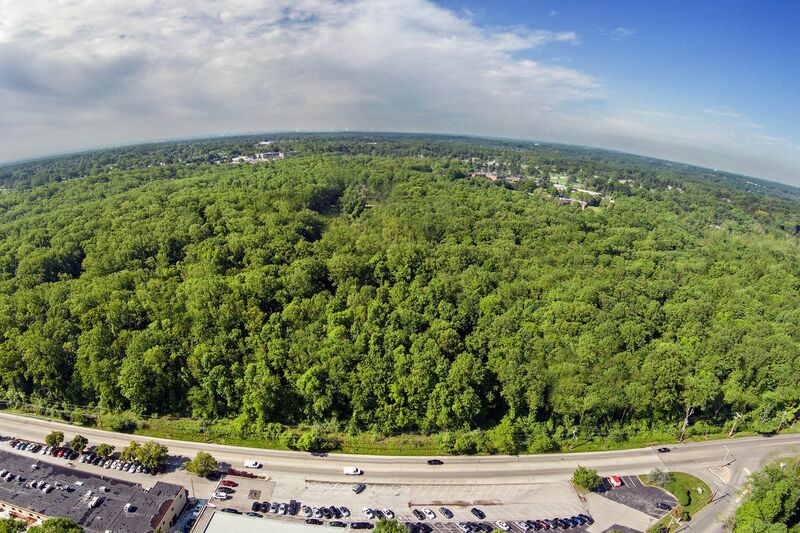 When 213 acres of rare Delaware County open space resurfaced on the market in 2016, Peter Miller, president of Carlino Commercial Development, knew he wanted to buy it. He had eyed the land in 2013, when the Archdiocese of Philadelphia first tried to sell it to help alleviate its financial woes. At the time, however, Miller faced steep odds: Archdiocesan officials wanted top dollar for the Marple Township swath, and multiple developers were interested. In the end, Carlino lost to Jenkintown developer Bruce Goodman, who offered $47 million for the mostly forested land, including a $5 million nonrefundable deposit. By 2016, however, Goodman's plans for one million square feet of commercial space and more than 300 homes were nixed. Residents had stormed meetings in protest, and townships officials ruled that his proposal was too large. Finally, after waiting nearly two years for Goodman to get approvals, the archdiocese pulled out of the deal and re-listed the land. Owned by the Archdiocese of Philadelphia for decades, the land is known among residents in the region for its trails and forest. Carlino, in partnership with Brian McElwee, president of Valley Forge Investment Corp., decided to pursue the land again. But this time, Miller knew, they would have to negotiate with more than the church. So, in the fall of 2016, they approached a residents' group with one question: Could they work together on a development that would please nearly everyone? Initially, it seemed, they had. At that fall meeting, both parties agreed: Carlino would redevelop the blighted Don Guanella Village, a former home for developmentally disabled men. The resident group contends Miller promised back then to limit his proposal strictly to the village, which measures 34 to 38 acres, depending on who is asked. Miller says he told the residents his plan included "some additional acreage." Either way, both agreed at the time that Carlino's plan was a satisfactory solution that ultimately would save most of the land. Now, Carlino and those residents have accused one another of backtracking. The residents, organized under Save Marple Greenspace, claim that Miller has increased the development's size beyond what they say he promised. Miller, similarly, says the group withdrew support and began to publicly denounce him only after he agreed to buy the property. Peter Miller, president of Carlino Commercial Development, outside of a Wegmans in Glen Mills, Delaware County, in 2015. Miller plans to include a Wegmans in his proposed development in Marple Township. The resulting dispute in this 10-square-mile, middle-class town highlights the ever-constant tensions between development and open space. As Philadelphia's suburban population continues to grow and development booms, residents have organized in droves to protect land that remains. Yet unlike other open-space disputes, the fight in Marple about who promised what at that 2016 meeting boils down to a difference of less than 20 acres. Plus, Carlino's preferred development plan for the land still includes preserving 160 acres, more than three times the 53-acre commercial and recreation complex that he has proposed for the remainder of the property. But unlike Goodman, who sought a simple yes or no on his proposal, Miller says he has a backup plan if his preferred 53-acre development, which requires a zoning change, is denied. Under the land's current residential and institutional zoning, he has stressed, Carlino will build a bigger, denser development, with 232 houses and some kind of institutional facility — all of which would not require a change in zoning. His back-up plan would eliminate much of the forest. The two potential plans have divided township residents and left officials in Marple in a precarious position: If they deny his 53-acre commercial and recreation complex proposal, will Miller follow through with his warning? But if they accept Carlino's preferred plan, many opponents wonder, were they manipulated? Bounded by Sproul and Reed Roads and steps from I-476, the 213 acres were not always coveted by developers. For decades, the archdiocese operated the Don Guanella Village there, leaving the rest as forest, slopes, and streams. According to residents, the space was used by hikers and bikers, with little opposition from the church. The current Don Guanella footprint, according to Google Maps. The village, once a former residence and worksite for disabled men, sits along Sproul Road and is backed up by forest and trails. The Archdiocese of Philadelphia is not selling the land associated with Cardinal O’Hara High School, which abuts the 213 acres to the right. Then, in 2013, that changed. The archdiocese was "in critical condition on the financial front," Msgr. Daniel Kutys would later write in 2015 to Delaware County resident Ken Hemphill, communications coordinator for Save Marple Greenspace. It was aching from an $80 million shortfall in an investment fund for parishes. So, it put the 213 acres — now valued at a total $41.3 million, according to Delaware County — up for sale. By that time, however, residents had grown accustomed to using the land, even if it was never theirs. So when Goodman proposed a plan to clear-cut most of the forest, residents forcefully resisted — and won. In a 2015 presentation to the township, Bruce Goodman revealed his plans, which included more than 300 homes and nearly one million square feet of commercial space, pictured here. According to Miller, Carlino had a different idea. "We wanted to create a plan that would be buildable, marketable, and make sense financially — yet respond to the concerns of Marple," Miller said. "And for better or for worse, we took Save Marple Greenspace to be the representative of Marple." Miller would not disclose the price he agreed to pay for the property, and an archdiocesan spokesman declined to comment on a settlement date. According to someone familiar with the terms of the deal but who was not authorized to speak publicly, Carlino is making monthly nonrefundable payments to the church until settlement, though the amount was not disclosed. According to Miller, Carlino has no plans to walk away — and will develop whether or not it wins the zoning change. Under Carlino's preferred option, the group would build a 47-acre commercial complex, with a Wegmans, a medical office building, multifamily senior housing, and more. The site would include six acres of recreation fields, totaling 53 acres of development. Carlino Commercial Development’s first-choice plan for the site, which includes 53 acres of development, including nearly six acres of recreation fields. The remaining 160 acres would be preserved. But for that plan to work, Miller needs buy-in from more than just Marple. Under the current proposal, Delaware County would buy the 160 forested acres, using tax-increment financing. What that means: Some of the property taxes from the site's development would be used to underwrite a bond that the county would then use to buy the land. Until that bond is issued, Miller said, Carlino would lend Delaware County the funds to purchase the land. According to John McBlain, chairman for the Delaware County Council, the county has spoken about "potential frameworks" for a deal, he said in May. County officials have also applied for a $2 million grant for the land, according to the Delco News Network, which will be matched if awarded. Carlino has yet to have discussions about the proposal with the Marple Newtown School District, which relies on property taxes for its budget. Meanwhile, Joe Rufo, president of Marple's Board of Commissioners, said "a lot of questions need to be answered." "We don't really have enough information on whether or not the tax revenues are really going to generate what the developers say it's going to generate," Rufo said. Beyond that, Rufo said, the commissioners are not leaning one way. In contrast, Carlino's alternative under existing zoning would take down most of the forest to build 232 houses. The Don Guanella Village land, zoned as institutional, would likely become a facility such as a hospital or school, Miller said. "Ultimately, it's the choice commissioners will make," Miller said. "We'll go either way." An aerial view of the 213-acre parcel during the winter months. Even while Miller has emphasized his preference for the 53-acre development, his team has also submitted the alternative for preparation by planners. In response, county and township planning officials have responded with lengthy and specific letters, ordering that more work be done to study and improve traffic, open space disruption, stormwater management, and other issues. Ken Hemphill in Chester County in 2017. In addition to fighting against Carlino and Goodman in Marple, he has assisted in efforts to oppose development on Crebilly Farm in Chester County. "We are not afraid of forcing" Miller into building the denser plan by continuing to fight him on the 53-acre proposal, said Hemphill, of Save Marple Greenspace. "We know he's proposed [a denser plan] that can't be built." For Save Marple Greenspace, the foremost problem remains traffic. By Miller's estimates, his proposed 53-acre complex would add nearly 20,000 car trips — about 10,000 cars — each day. Reducing the 53-acre complex to a smaller size, he argues, would not supply enough taxes to fund the county's purchase of the forest. "Sproul Road is a parking lot … and adding a few turn lanes does not make the problem go away," Hemphill said. "Carlino keeps asking for something that just doesn't fit. … It's a monster." Still, other residents say they believe Miller is serious about proceeding with his denser plan if his zoning request is denied. They fear the fight over a few acres could destroy an entire forest. "People are saying [his alternative] is a bluff, but I'm not willing to call that bluff," said Chip Stracciolini, president of the Marple Newtown Soccer Association, which advocated for Miller to add recreation fields to the development. "That's a pretty big bluff, and a pretty big risk." Streams and slopes run through the 213-acre site in Delaware County.